Home » Career and Income » Career Building » 10 Ways to Combat "Impostor Syndrome"
Have you ever walked into a meeting hoping that you'll be able to convince others that you're an expert in your field, when in reality you feel as if you're faking it? Have you ever feared that you would be "found out" to be less competent than others think you are? 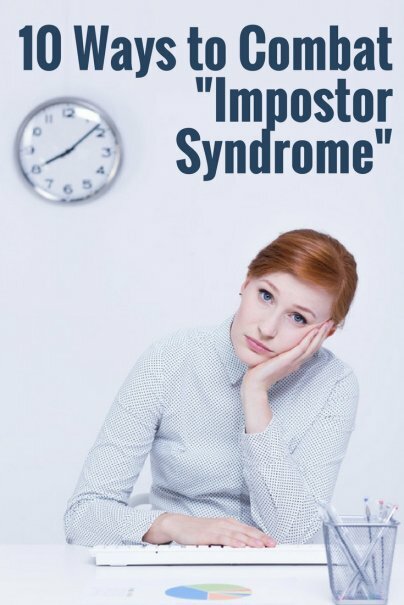 The "impostor phenomenon" was first described in 1978 in a study about professional women who believed that they had achieved their success by luck or by mistake, instead of by their intelligence and competence. The good news is, research shows that impostor syndrome isn't really a syndrome — it's not a personality trait, nor a mental disorder, nor is it rare. In fact, almost everyone experiences it as a reaction to a situation at some point. With that in mind, there are some strategies you can use to combat feelings of inadequacy and to feel confident in your own abilities. Some of the most successful people in history have described feelings of disbelief in their success. From Maya Angelou to Albert Einstein, many famous achievers felt that they did not deserve the accolades and success they had achieved. So if you have similar fears of being found out, know that you're in good company! Most likely, everyone in the room has had similar feelings and insecurities. It kind of makes you feel better about your own feelings of inadequacy if you know that the person you're talking to most likely feels them too, doesn't it? We're all just faking it till we make it. When you feel that you don't have what it takes to succeed, it can help to talk with a trusted friend or mentor who can give a more objective perspective on the situation. A supportive friend who knows your abilities and successes can encourage you, can point to reasons why you shouldn't feel nervous about your abilities, and can help you think through the situation. Even if they are simply repeating things you already know ("You've already done a project like this, and you can do this one, too"), it can help to hear it come out of someone else's mouth. You may feel like the least qualified person in the room, but that doesn't mean you don't have something to contribute. Often, people with an outsider perspective are able to see solutions that seasoned experts miss because they're too close to the subject. Outsiders are often able to reframe the problem to see from a different perspective. So even if you have less expertise, think of your outsider status as an asset, not a liability. Try to stop yourself from using phrases like, "Well, I'm no expert, but I think …" or "I don't really know what I'm talking about, but …" While such refreshing humility can be appealing on a personal level, they can undermine you on a professional level. Don't make others doubt your opinion before you even give it. There's a difference between acknowledging that you don't have all the answers, and tearing yourself down. Many people who experience impostor syndrome associate achievement with self-worth. Surround yourself with friends and mentors who value you not for what you achieve, but for who you are as a friend and as a person. And realize that no matter how much you achieve, success alone will not make people genuinely love you or care for you. Many people who struggle with impostor syndrome also tend to be perfectionists who cannot let a task go until they have overplanned and overworked it to the point of exhaustion. Or, that perfectionism might manifest itself as a fear of trying a new task because you might not be able to do it perfectly. Either way, overcoming impostor syndrome involves being able to do a task well enough, instead of perfectly. Cut yourself off when you find yourself obsessing over making something perfect. In my experience, the more you fuss over it, the less creative and fresh the final result will be. If you don't allow impostor syndrome to cripple you from taking risks, it can actually bring about some positive effects. Acknowledging that you don't have all the answers can create an atmosphere of trust, communicativeness, and teamwork. Case in point — I recently went to a media event, and a blogger at my table openly admitted, right at the beginning of the event, that she had been nervous about coming because of her so-called social awkwardness. You could almost hear the collective sigh of relief going around the table — we were not alone! Impostor syndrome means that you know you have a lot to learn, which can push you to be more innovative, more team-oriented, and more hardworking. So next time impostor syndrome whispers in your ear, treat it like the friend (or frenemy?) who keeps you on your toes, but sometimes needs to be put in its place.